Arthur Morgan was my 1st cousin 5 times removed, as he was the nephew of my gggg grandmother Janet Sangter, whose sister Isobel Sangster married Peter Morgan. Arthur was born in 1815 at Longside, he married Margaret Robb and had 4 children. Then Margaret died so in 1849 Arthur married Catherine Kilgour Adam and had another 3 children. 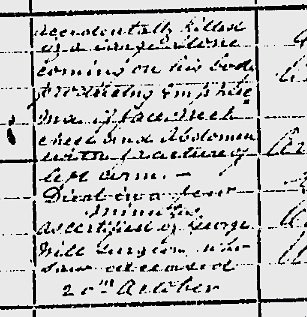 In the 1851 census he was working as a farm servant, but he must have changed jobs and gone to work in the granite quarry at Longhaven, which is between Cruden Bay and Boddom. Sadly, Peter met a premature death there. I found the writing for the cause of death a bit tricky to read on his 1860 death certificate, so posted a scan of it on the RootsChat forum, to see if one of the helpful people there could work it out. Sure enough they did. Accidentally killed by a large stone coming on his body producing emphysema of face neck chest and abdomen with fracture of left arm. Died in a few minutes. As certified by George Mill Surgeon who saw deceased 20th October. So basically, poor Arthur Morgan was crushed to death by a large granite stone falling on him. He was 45 years old and left a widow, three young children and four children of working age. This entry was posted in Family history, Genealogy and tagged Cruden Bay, Morgan. Bookmark the permalink. Good old Rootschat. That’s the thing I love about the internet – no matter what your question is, someone out there will be able and willing to answer it. RootsChat is great. I return the favour whenever I can by helping anyone who’s stuck, particularly with Scottish research. They’re a very friendly and helpful bunch on there.